With a brand like Mercedes-Benz there’s a rich history of quality and luxury, but sometimes a client comes along who wants more and isn’t afraid to pay a premium for it. This where the Mercedes-Maybach line of cars comes in - to offer buyers the absolute best in luxury and refinement with exquisite appointments and an increase in space. The double-M logo lets others know that someone quite important may be on board, usually a captain of industry or tech entrepreneur. Having a silky smooth twin-turbocharged 463 hp V8 is a definite selling point of the Mercedes-Maybach S560, but for those higher up the corporate ladder the Mercedes-Maybach S650 offers a powerplant with four extra cylinders – that’s right, it features a twin-turbocharged V12 with a massive 621 hp available. Driving the Mercedes-Maybach S-Class is a pleasure, and likely won’t be done often by the car’s owner but instead by a dedicated driver, which is a pity. At almost 18-feet long and over 5000 lbs., you’d expect the luxurious Maybach S-Class to feel heavy and cumbersome but technology makes sure it’s not the case. The Airmatic air suspension continually monitors the road surface to supply the optimum firmness at all times, and combined to the 4Matic all-wheel drive and that powerful V8 in the S560, the large sedan is rather sprightly and can stick to the tarmac brilliantly, even during high speed highway sweeps. Even at full tilt the boss in the back seat will feel the speed but not hear it, such is the sound insulation in the car. Steering feedback is muted but that’s expected to keep things smooth, actually everything about the car is to keep it smooth. Power delivery is as linear as possible; you don’t want the boss to spill his Remy Martin. The S650 is over 200 lbs. heavier even without an all-wheel drive drivetrain, but you’ll never feel the weight because the V12 has more torque than sense. The Mercedes-Maybach S-Class is a hulk of a machine with a length of nearly 18-feet and over 5000 lbs. and to get it up and running the engine options need to be powerful, and they are. The S560 makes use of a 4.0-liter V8 with twin-turbocharging that produces 463 hp and 516 lb-ft of torque. The 4Matic all-wheel drive system is mated to the 9G-Tronic 9-speed automatic transmission and the combination is brilliant, the shifts are precise and fast, and can be done via paddle shifters too, although what situation requires that is a mystery. Performance figures are claimed at 0-60 mph in 4.8-seconds with a top speed limited to 130 mph. The S650 features the monstrous 6.0-liter V12 that’s also twin turbocharged, and here power is at 621 hp with an amazing 738 lb-ft of torque. Power goes to the rear wheels only and the automatic transmission has two less gears, but with appropriate ratios. 0-60 mph in a ludicrous claimed 4.6-seconds and top speed is at 155 mph. The Mercedes-Maybach S-Class is built to have as much equipment as possible, and there is a lot of it. Among other things you’ll find like a Burmester surround sound system, wireless charging front and back, Apple CarPlay and Android Auto, a rear seat entertainment system with screens and fold down trays, Energizing Comfort Control that includes a massage function and a fragrance system, and even a 64-color/3 zone ambient LED lighting system to enhance aesthetics and moods. Active and passive safety is numerous including a Torque vectoring brake and adaptive braking technology, 9 airbags including a cushionbag in the seat, Car-to-X communication and all manner of assist systems. When you’re at the top of your game and you want to travel in style, the Mercedes-Maybach S-Class is worthy of consideration. The two trims feature bold and imposing exterior styling, an ultra-luxurious cabin made up of some of the best leathers and material available and a powerful twin-turbocharged powerplants that will ensure getting to meetings on time. If you get stuck in traffic the onboard tech and features mean business can go ahead as planned all while getting a massage. The large sedans are expensive, but in their segment they looks to be priced better than most, making it an attractive buy to someone in need of a driver and car setup. 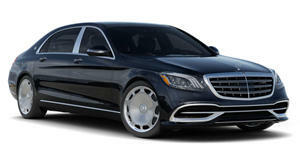 You can show off status with the S560, while the S650 is there to display wealth.